Comprehensive Beatdown is 30 episodes this old this week! 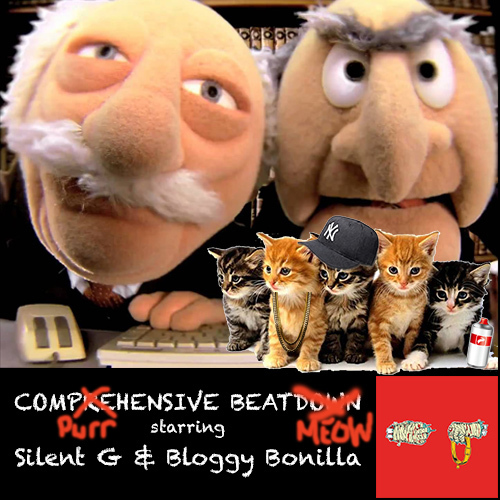 For this special episode, Bloggy Bonilla and Silent G listen to “Meow the Jewels,” which probably needs no introduction to our listeners. But we’ll give it to you anyway. “Meow the Jewels,” which began as a joke “bonus package” buried deep in the email announcing the varying release formats of Run the Jewels 2, came to fruition after a group of friends contributed over $40,000 to an online campaign to make Killer Mike and El-P produce the record. A wide array of guest producers were brought in to complete the project, which is a full remix of Run the Jewels 2 album, using cat sounds for the music. All proceeds from the online campaign were donated to charities that benefit the victims of police brutality. The intro music is from “Seven Seas,” the new record from Emancipator, which dropped on September 25th.